InActivity videos of Cardinal Wolsey #narrowboat #england – The Diesel-Electric Elephant Company. Two videos, about three minutes each. The grass moves a bit, the water ripples occasionally and, if you watch really closely, the clouds drift by. Cardinal Wolsey at rest. I know that not many of my readers (either of you…) will have six or even just three minutes to spare from the (insane) pace of “modern” “life”, but the videos are here in case you can. Ignore the timestamp, the video camera fibbeth – this was 02/02/2018 or, if you’re American, 02/02/2018. I left the microphones running but there was not really a soundtrack to catch. A bird-call in the distance, an aeroplane droning overhead, a cow singing opera somewhere in winter cover or a sheep bleating on about “ooh – grass! my favourite!” so I put you a couple of thrash rock “the heaviest metal” tracks on instead. Pump up the volume (ooh, that dates me)! Forget Formula One, forget down-hill skiing and forget live video feeds from the Palace of Westminster – watching a narrowboat sitting at his moorings is where the groove thang is at. We’ve had the frantic activity of crossing the World Heritage Site Pontcysyllte Aqueduct, I’ve talked you around perhaps a hundred and eighty miles so far in this licence period (probably two hundred and something by the end of it). The next few months will include – I hope – the Anderton Boat Lift among other Victorian engineering wonders. For now though, tis time to relax, time for you to ease yourselves into the pace of canal living as I oft experience it. This is what the Cardinal does when we get where we’ve got and after I tie the planet to him with a couple of stout ropes. He goes to sleep, I put the kettle on and my feet up. The flue here is smoking because I had just re-animated the stove after his nocturnal slumbers. The “smokeless” (invisible smoke) fuel kicked in soon enough afterwards. Yep, that scuzz on the canal is ice. He’s not “just” a boat, he’s my home. To borrow the language of Wallace and Gromit, it’s a reet grand feeling to walk back along a towpath and see him patiently waiting there for me. 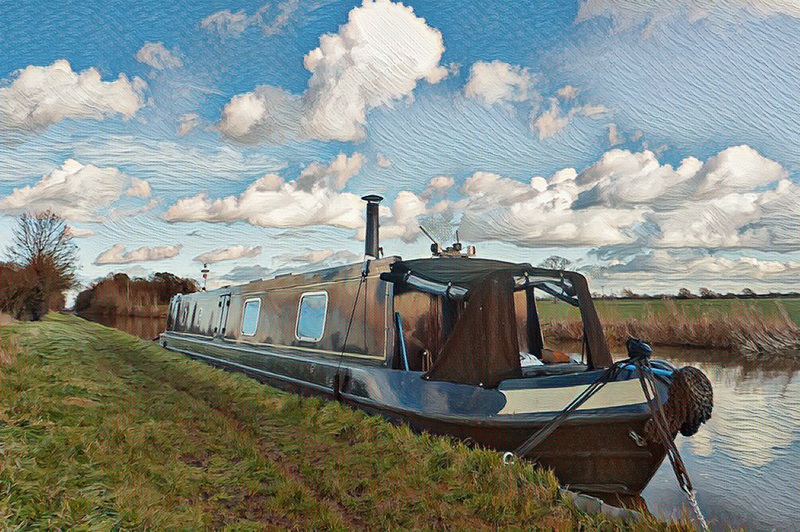 We’ve mooched on again a little since the videos – Her Maj’s Meteorological Office predicted that this week would be the coldest (so far) of the winter, so we’re re-serviced, fully watered, emptied, re-bunkered and hunkered down farther up the canal. Let the polar bears commence. There’s a couple of months at least to Spring, mayhap three or more until we get to more clement weather – as reliably clement as it ever gets in England. I have a growing list of DIY jobs to do then. Some paintwork, maybe the tunnel and bow stripes (possibly in a very non-traditional silver-grey zig-zag), a couple of electrical jobs and some woodwork. One of the woodwork jobs is to replace a large footstool with a “retained heat” cooking box (a “hay box cooker“), ready for next Autumn. I’ve designed one that will also be storage for my selection of billycans and still see service as a footstool. Not only will I then be able to cook – what else? – curry and rice on a gnat’s fart-worth of gas, but having somewhere to store the billycans will free up a corner of the worktop in the galley for other things. Wine-making for one. I am going to make some secondary double-glazing units ready for next winter too, slip-in, slip-out jobs that store away neatly when not in use. The 8th of February 2018 sees the completion of my first year of cruising about, and my second year of living aboard. Time flies like an arrow but fruit flies like a banana. Farther and wider will be some of the formula this coming year, a few adventurous arcs outside of my “familiarity zone”. I do reserve the right to hoof it back to the tried and tested should I feel the need to not explore for a while! We’ve very comprehensively, very slowly, explored all of two canals and parts of two others – the Llangollen, the Middlewich Branch of the Shropshire Union, some of the main Shropshire Union and a smidgen, the tiniest smidgen of the Trent & Mersey. Being a nosey bugger I haven’t just limited my sniffing about to the canals, I’ve wandered off a few miles either side of the towpath, and seen a mile or two of England (and some of Welsh Wales) in the process. We’ve baked, we’ve frozen, we’ve been becalmed and we’ve been lashed repeatedly with 60mph gales. We’ve done deals (for coal, wood, ironmongery, chemicals and ropes) boat-to-boat in the dark in the middle of nowhere. We’ve been damned near sunk by being cilled by the “professionals” at a certain set of staircase locks. We’ve been screeched at by harpies on boats who screeched at us because they couldn’t get close enough to the person they really wanted to sceech at and we were second best option (fortunately I had a packet of fresh Short Shrift with me). We’ve had our ropes peed and pooped on by mutts untended by their keepers (and we’ve had words with the keepers). I’ve monumentally cocked up some manoeuvres (with international audiences), and I’ve performed other manoeuvres magnificently (though rarely with any witnesses). I don’t doubt that it will continue to be so. In my childhood and youth the politicians promised us that we’d all be living Jetsons-style lives in outer-space before the century was out, but somehow in the dim and distant, futuristic world of 2018 I seem to be living with a taste of the Victorian ethic, in an oddly-shaped bucket floating along a damp ditch. I didn’t see this one coming, but it’s really rather splendid now that it has. I have the feeling I need a cigar somehow and there was a distinct feeling of discomfort in my nether regions with my voice going up an octave but perhaps thrash music always has that effect.What I am fascinated by are the silver zig-zag go faster stripes you’re contemplating. I assume it’s all something to do with air resistance when you pick up speed? Takes me back to my own days in the choir – I only ever sung in the noisy bits, I didn’t want my screeching and warbling to ruin the really musical parts! It is rather splendid. In touch with real life well lived – not the busy being busy loud one most live thinking that’s all there is. Many thanks, sir, the reblog is much appreciated! Another great post, despite my also unconventional living accommodation I am fascinated by yours, oh and I’m glad you were able to point out the difference between our date make up and that of our transatlantic cousins. Enlightening. Just what the doctor ordered on a busy day in the ‘bubble’. You play the piano beautifully and I guess you will sound a little different when your voice drops….. They remind me that life is at it’s best when are just feeling a moment of quiet.